Not to be confused with S v Williams. 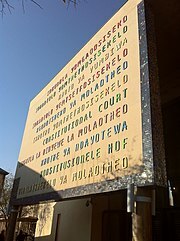 S v Williams and Others is a decision of the Constitutional Court of South Africa in which the court ruled that judicial corporal punishment is unconstitutional. The decision was taken with respect to five different cases in which six juveniles were convicted by different magistrates and sentenced to receive a "moderate correction" of a number of strokes with a light cane. ^ "Section 13: The abolition of JCP". Judicial Corporal Punishment in South Africa. World Corporal Punishment Research. 2005. Retrieved 15 October 2012. ^ Angus, Laurel (1996). "Case Report: S v Williams". South African Journal on Human Rights. 12: 142–145. This article relating to case law in South Africa is a stub. You can help Wikipedia by expanding it.